This page gives an overview of the oldest Slo-Syn stepper motor drives. 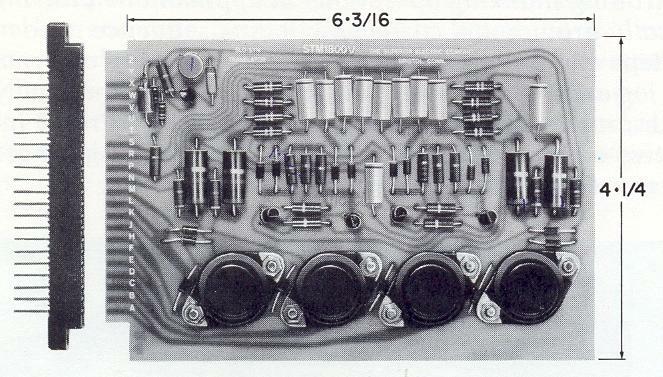 It starts with the STM250, from around 1964 and the end is around 1975. 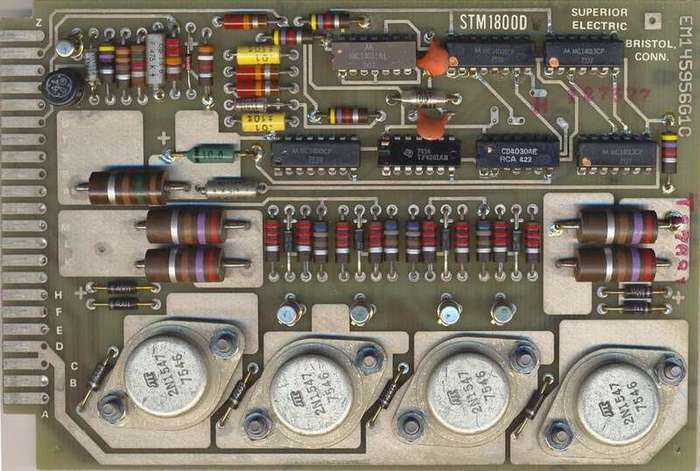 As far as I know the STM250 is the very first Slo-Syn Translator produced by Superior Electric. the photo shows a board from around 1965. Four TO3 germanium transistors for the power to the motor and four small 2N1302 drivers with a lot of capacitors, resistors and diodes. 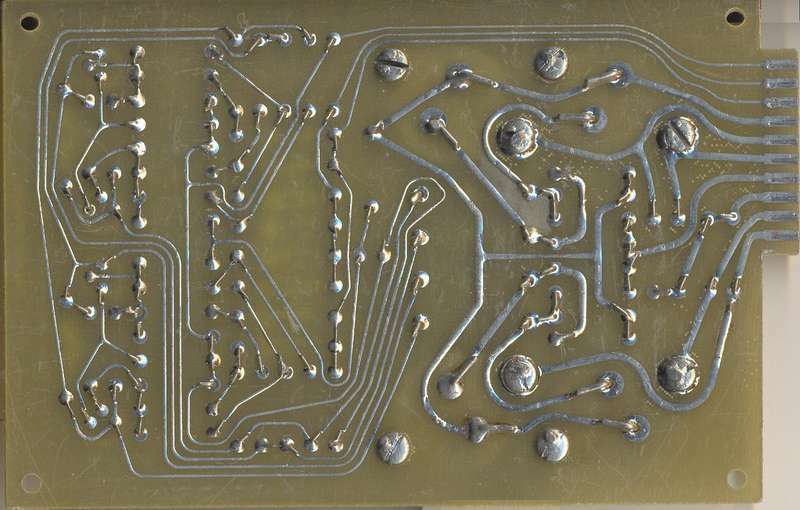 There is no date on the board, but one of the transistors, a 2N1302, has a date stamp that shows : 6451. Usually this is the two lower digits of the production year, followed by the week number. The translator ST1800B is an enclosed, self-contained pulse-to-step converter for use with specific bifilar motors. It converts low-level signal pulses or square waves into the correct four-step switching sequence needed to step a SLO-SYN motor at speeds from a to 500 steps/sec. Input may be triggered by a pulse, square wave or by an external switch. Appropriate dropping resistors are also required. A doc power supply is built-in. Essentially, an Adjustable Speed Drive type ST1800BVX is a SLO-SYN Translator which includes a built-in oscillator to supply the triggering signals. The oscillator frequency can be adjusted to vary the speed from 4 steps per second up to the maximum permissible with the motor used. Direction of rotation can be controlled either from the front panel or from a remotely located switch. The oscillator can be bypassed whenever it is desired to operate the unit from an external signal source. SLO-SYN Adjustable Speed Drives have the same input, torque vs. speed characteristics and triggering signal requirements and are used with the same bifilar SLO-SYN motors as their corresponding standard translator models. SLO-SYN Translator Modules STM1800C and STM1800CV stepping speeds of 50 to 2000 steps/sec. 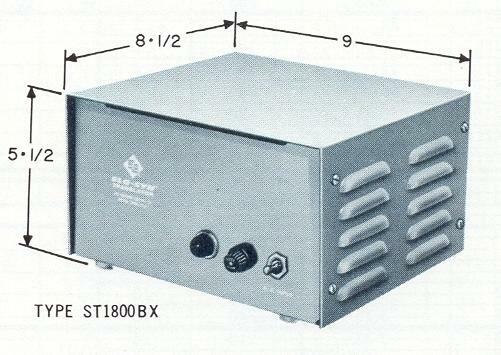 Type STM1800C i translator capable of bidirectional operation of M Serie, Type STM1800CV is similar but includes a built-in ose provide the triggering signals and a potentiometer for speed adjustment. They drive the motors in steps of 1.8º ( per revolution). Both require a 10 amp power supply tn T6382, doc bridge and appropriate dropping resistors. Used with specified M Series motors to provide a stepping speed of 100 to 5000 steps/sec. Acceleration and deceleration are adjustable when using the internal oscillator but must be supplied when using external pulse sources such as tape readers and computers. 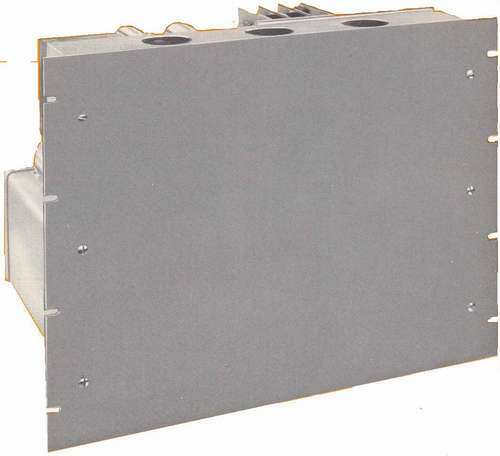 This unit is designed for mounting in a 19 inch rack. SLO-SYN High Speed Translator HTR103RT provides a stepping speed of 100 to 3000 steps/sec. Other features are similar to HTR105RT. Drives specified M Series motors in re­sponse to commands from devices oper­ating at a fixed pulse rate. Provides speeds of 100 to 5000 steps/sec. Stores incoming pulses and feeds them to the motor, automatically accelerating and decelerating at a compatible rate. Acceleration rate is approximately 15.000 steps/sec2. Designed for rack mounting. The STM 1800D and STM 1800DV SLO-SYN Translator Modules can drive SLO-SYN Stepping Motors in either the half-step or the full.step mode. Type STM 1800D is a basic translator which allows bidirectional stepping control of a SLO-SYN motor. Type STM1800DV also provides bidirectional stepping control, but includes an internal oscillator which can be used to trigger the unit. This board was using CMOS technology for the translator. 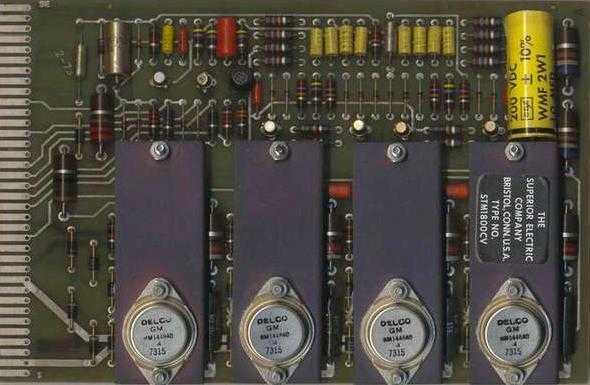 The oscillator was still made with an unijunction transistor. A 500K ohm, 10-Turn potentiometer is supplied for controlling oscillator speed. The STM1800D and STM1800DV have a set circuit which always applies power to the same two motor windings whenever the modules become energized. Each module is supplied with a 22-pin edge connector for installation. A 500K ohm, 10-Turn potentiometer, partnumber A201893-G1 is supplied for controlling oscillator speed. 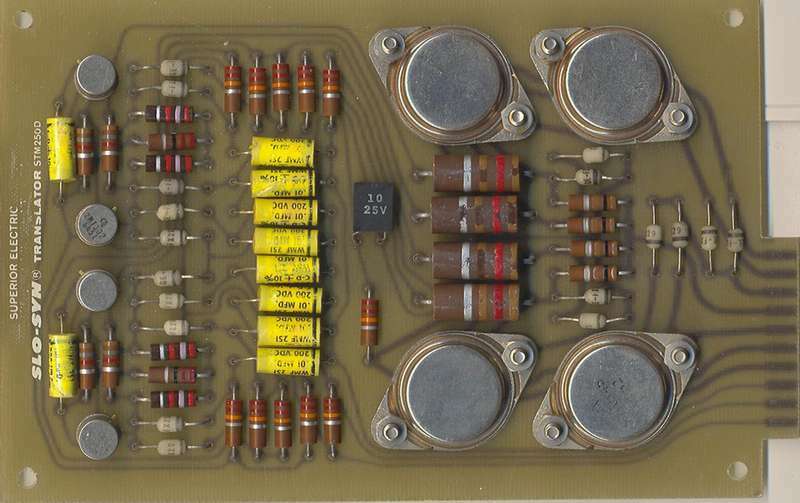 This was one of the first boards supplied with this potentiometer. Special of this potentiometer was the internal gearing with a ball drive. The gear ratio was about ten times.